White Walker by Johnnie Walker will be available globally and is part of a wider Game of Thrones partnership. Diageo has collaborated with HBO to launch a limited-edition White Walker variant of Johnnie Walker, inspired by Game of Thrones. The Scotch has notes of caramelised sugar, vanilla, fresh berries and orchard fruit, Johnnie Walker said, and features single malts from Cardhu and Clynelish, one of Scotland’s most northern distilleries. The bottling is inspired by the "frozen north", from where the White Walkers emerge in the fantasy series. It features a white-and-blue design and the Johnnie Walker Striding Man icon. The product will be available globally. 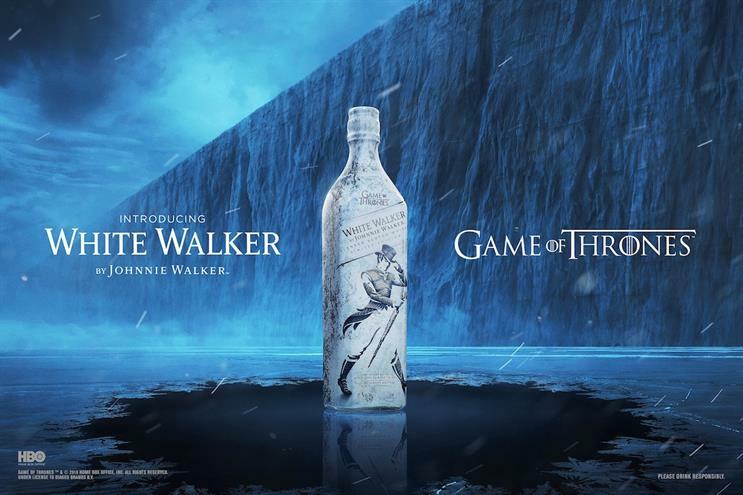 White Walker by Johnnie Walker is part of a wider partnership between HBO and Diageo that will also see the launch of the Game of Thrones Single Malt Scotch Whisky Collection available from February 2019. There will be eight scotches that are paired with one of the houses of Westeros from the show. Jeff Peters, vice-president, licensing and retail, at HBO, said: "We knew there was fan appetite for a Game of Thrones whisky and, once we saw the vision from Johnnie Walker for a way to collaborate, we knew the idea was perfect and the time was now. "From the beginning, they understood that we wanted to create something special, and they’ve accomplished that with White Walker by Johnnie Walker. We’re confident fans will enjoy sipping this delicious whisky as they wait for season eight and beyond."